Are Mobile Payments the future? I remember when I got my first mobile phone; I didn’t buy it from a phone shop, far from it. I bought my Motorola MR201 from Halfords, for ‘emergencies’, when I was 18 years old. I had just passed my driving test. Back in 1999, the thought of using a mobile phone for anything other than a call was incomprehensible. But over a decade later, much has changed; my smart phone is an integral part of the running my life, both socially and for work. The digital age is changing the way that we do business and run our day to day lives. In 2014, 3% of all retail sales by value were made via a mobile device. This figure is predicted to rise to 9.1% (£32bn) by 2019. It seems that every day, improvements are being made to make our lives easier, whilst some new tech fails to ever really take off, many succeed and we find it difficult to remember how we ever got by without them. It has taken some time for mobile payments to really get going, they have been touted as the next big thing for a while now, but it wasn’t until 2015 when Apple Pay was launched that it began to take off. Industry experts have predicted that mobile payments will bring the end of the traditional wallet, but like the death of cash which has been thrown about for the past 10 years, will our traditional payment methods give way to mobile? According to Gartner, the global market for mobile payments will be worth $720 billion in transactions by 2017. In 2014 cash payments were over taken by electronic transactions for the first time; there were around 18 billion cash transactions, and over 20 billion electronic transactions according to figures from the trade association Payments UK. So, the future looks bright for mobile payments, Samsung Pay in Korea is proof of this as it recorded $30m worth of transactions in its first month. But there are some pitfalls, which could mean that it takes a little longer for it to be as mainstream as many analysts would like. When you pay with Apple Pay or Google wallet, the merchant never actually sees your credit card information. Instead they get a one-time code or token that authorises them to make a single charge. Some other mobile wallets are less secure; PayPal for example stores your card details, so if they were compromised hackers could gain access to your card details. 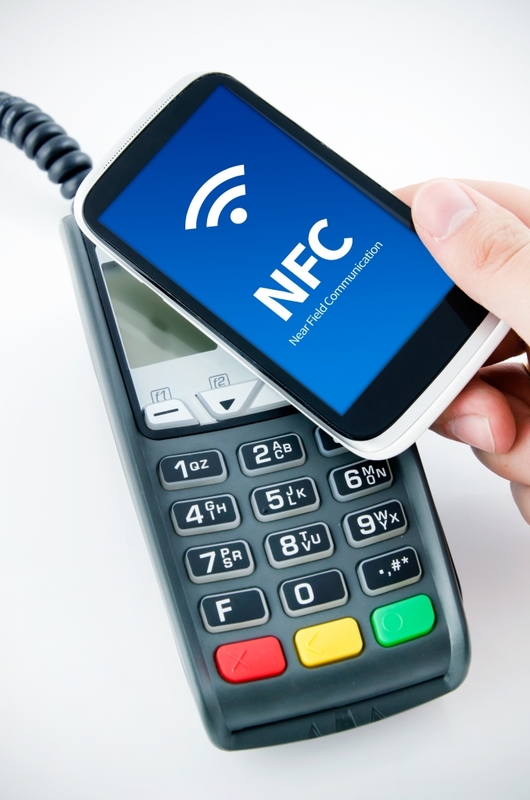 Not all merchants accept payments via mobile, older terminals and POS systems may not be compatible with NFC and contactless technology which can cause some restrictions for the consumer. If you pay by cash there is no means of tracking your information, preferences or personal profile. Paying by card can provide customer insight, however not all merchant services organisations provide this, but with mobile payments there is a wealth of data available to mobile payments providers. Mobile Payments is the link between the online and offline world, providing a seamless shopping experience for consumers. Mobiles have access to information that can be used to track what the consumer does across the device, making it a useful marketing tool. Mobile payments are set to increase, every business owner is looking for a way to get paid faster, more conveniently and attract more customers, and by offering new and innovative payment methods such as mobile you can do this. Will mobile payments take flight? Generation Y are more likely to test new technology and embrace mobile payments. Despite the UK being an ageing population, you only need to look as far as the decrease in the use of cheques to see that the way we pay for goods and services is changing. Speed and convenience is of big benefit to consumers, with mobile payments the customer simply passes their mobile device over a near-field communication (NFC) and away they go. According to Demandware’s Q2 2015 Shopping Index mobile phones are driving 25 per cent of all digital transactions in the UK, a 45 per cent increase year over year. Businesses that work outside of a ‘normal’ retail environment are often limited to accepting payment by cash (which has a security risk associated with it, not to mention the cost to bank cash). If you are paid by cheque, you have to wait for it to clear or for it to arrive by post. But what is out there to help businesses that fall outside of a normal retail environment? Mobile payment app Vs mobile Wallet? A mobile payment app is a way of taking payments using a mobile device, such as your smartphone or tablet. They are a great tool if your business is not based in a traditional setting. Some apps require additional hardware such as iZettle, Sum Up and Square, while others like appay from NetPay Merchant Services and Global MPOS from Global Payments which do not require any other hardware. A mobile wallet requires a payment app to be installed upon the consumer’s mobile device, where they use it in a traditional retail environment to tap and pay for goods and services on a contactless device. Examples of these apps are Apple Pay, Samsung Pay and PayPal Here. Many of the mobile wallets require some kind of registration in the first instance, registering your bank account or credit card with the device so that it can be used to pay for things on a contactless or NFC terminal. There is a lot of choice out there and some interesting solutions. The mobile payment sector will continue to grow an innovation will be at the forefront. Simplicity, speed, security and convenience are the first words that spring to mind when looking for a payment app, keeping it as simple and fast and possible is really important. How will we be paying for things in the next decade? Like any new technology we are in the early adopters stage, mobile payments will take time to bed in and there are likely to be a number of teething problems. One such problem is the fact that many retailers request to see the card to process a refund. Mobile payments are here to stay; adopting this technology early will keep you ahead of your competitors and provide more convenience for your customers. What is next will be anyone’s guess – I will have to look into my crystal ball or be patient and just wait!